Halfway through the year, we found out that 2016 is the international year of pulses, and we took just a moment to appreciate the quintessential Indian household staple, the dal. While we’re happy dipping chunks of chapati into bowlfuls of yellow dal, we also like taking it up a notch every now and then. We scoured the city for the yummiest dals and dal dishes in and around the city, and here are our finds. The Dal Bukhara at ITC Maurya has attained legendary status over the last few decades, and for good reason. A concoction of black lentils, tomatoes, garlic and ginger, their dal is slow-cooked for 18 hours straight in a tandoor. The creamy texture remains unmatched; when we crave comfort food at the beginning of the month, Bukhara is where we head to. #LBBTip: Pair it with one of their giant naans for the best results. 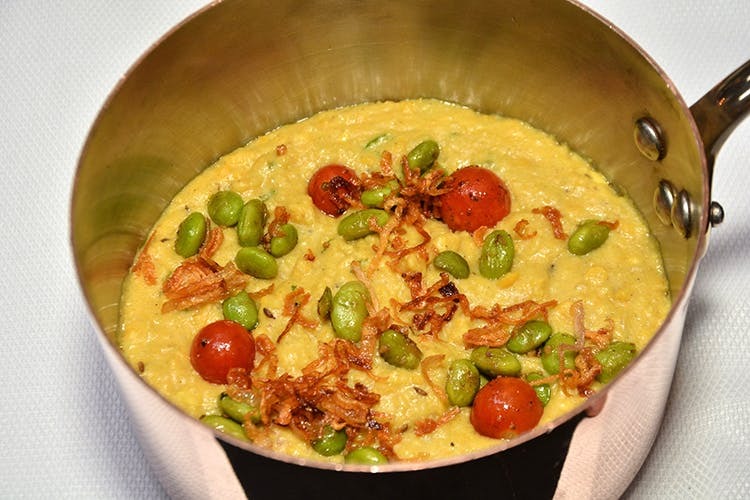 One of the most common dal dishes in every household is the khichri. Usually associated with illness, it isn’t considered to be a treat but the Khichdi Rafat at Varq breaks this stereotype. The restaurant uses a 300-year-old recipe of the Hyderabadi Nizams comprising rice cooked with morsels of duck, lamb and chicken and flavoured with spices and almonds. Possibly a take on the Dal Bukhara, the Dal Baluchi at The Lalit has one of the best dal makhnis in the city, as per our experience. Thick, creamy with just a hint of tomato; it tastes best when eaten with a fresh garlic naan just out of the tandoor. #LBBTip: While you’re here, make sure you order the Mushroom Galouti kebab, too. One of our favourite Parsi dishes, the dhansak is a preparation involving meat cooked along with dal, and SodaBottleOpener does this super well, serving it with caramelised rice and kachumbar. Whereas the dish traditionally calls for meat, the peeps at SodaBottle also have a vegetarian version with vegetables. An iconic offering at Embassy restaurant in CP, the dal meat combines lentils and mutton with typical north Indian flavours. While it is much like the dhansak, this dish holds its own against its regional cousin; the mutton is slow cooked with the dal, resulting in softer chunks and greater texture with an interesting mix of both the flavours. We know you frequent Beeryani for its beer towers, chicken tikka and, of course, biryani, but the next time you’re chugging, do ask for their Moong Dal Halwa; it’s the perfect way to end your meal. We love that it’s rich without being overly sweet.